Unfortunately this item has been sold. However we may have more of the same item in stock or a similar item that may meet your needs. Please scroll to the bottom of the screen for similar items or feel free to browse our sight. The Thermo Sorvall Legend XTR is a robust table top refrigerated centrifuge used for multiple lab processes. The Sorvall Centrifuge has a maximum capacity of three liters per run and can be used for multiple applications including cell culture, biotechnology, food safety, bioproduction, blood separation and many more. The Sorvall Centrifuge tops out at speeds of 15,200 (25314 x g) using a fixed angle rotor and comes with a pre-cooling feature to increase productivity within your lab. This state-of-the-art Sorvall Centrifuge is a market leader among its peers and continues to be the researcher’s choice for table top centrifuges. The Sorvall XTR Centrifuge comes with SMARTspin technology which auto detects which rotor is installed and comes with an imbalance sensor that adapts during each run. In addition, this easy to use benchtop refrigerated centrifuge comes with the new Auto-Lock Rotor push button system. This feature locks rotors into place with the push of a button, acting as a safe-guard for the user. Another feature included with the Thermo Sorvall Legend XTR centrifuge is the ClickSeal Bucket Sealing System, elimination the need to screw bioshield caps into place. This is ideal for users working on vaccinations, or working with virus, harmful chemical, etc. The Thermo Sorvall Legend XTR comes with microprocessor controls situated in the front of the instrument for easy access. Installation of rotors on the Thermo Scientific Sorvall Legend XTR Refrigerated Centrifuge is made as easy, and error free as possible. The auto lock rotor push button system automatically locks the rotor into place. A hybrid lid latch reduces wear and tear on the laboratory centrifuge while also improving lid closure times. Controls include speed, temperature, acceleration, deceleration, RCF, timer and more. Each of these centrifuge include a memory bank with 99 slots available intended for multi-user applications to be safely stored within the centrifuge. Programs can be password protected along with centrifuge for sample security in multi-user, or high security laboratories. This table-top centrifuges also uses 15% electricity per year, compared to most of the other benchtop centrifuges on today’s market. Instrument includes a hybrid lid latch to reduce wear and tear, while improving on lid closure time. Sleek, compact design allow this instrument to be put on virtually any lab bench within your lab. The Thermo Scientific Sorvall Legend XTR Refrigerated Centrifuge is microprocessor controlled, with easy navigation on an LCD screen located on the front of the instrument for quick access. Users of this table top centrifuge can adjust parameters such as speed, temperature, acceleration, deceleration, RCF, timer and more. Up to 99 user specified protocols can be stored, and password protected for sample security in labs with high security or multiple users. 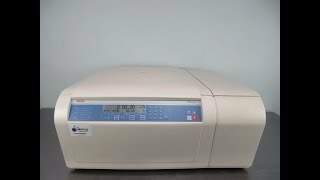 Contact us today for more information on our Thermo Sorvall Legend XTR Centrifuge, or a price quotation. This Thermo Sorvall Legend XTR Refrigerated Centrifuge has been fully tested to guarantee centrifuge was working up to manufacturer's listed specification. All of our lab equipment comes backed with our standard warranty. Should you have any questions, please don't hestiate to contact us.